Supplier & Manufacturer of Capsule Sorter Elevator.Our product range also comprises of Auto Polishing Machine, Automatic Capsule Filling Machine and Semi-Automatic Capsule Filling Machine. We bring forth for our esteemed clients a superior quality of Capsule Sorter Elevator. 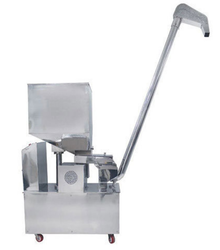 It is designed to sort out diametrically defective capsules before entering into the capsule hopper of automatic capsule filling machine to ensure minimum stoppage of the filling machine.